A porcelain repair or restoration is something you may face earlier or later if you are handling lots of antique porcelain or pottery. 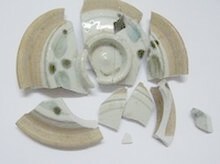 If your porcelain item is valuable or rare, then you may want to repair it. However, a do-it-yourself porcelain repair is not advisable in general, unless you are of a more adventurous nature and risk a botched job, or if you are seriously learning the trade. Special glues are required for professional porcelain repair, and worldwide there may only exist a handful or so different glues suitable for this specialized purpose. They are very expensive. Those glues at your hardware store that it says can be used for gluing porcelain or ceramics is not one of these! Avoid gluing porcelain with any glue sold at your local hardware store, it may not be suitable. These glues often will turn yellow after some time even if they are transparent at the beginning, and they may not be thin enough for the job. The broken lid of the 19th century medicine jar shown on the right is the result of careless handling. Lids and loose parts drop most easily. The fact that many antique teapots and jars have their lids missing says it all. The cleaning process may take quite some time as the pieces may have to be immersed in cleaning water for some time, and after cleaning they need to be left to completely dry for many days. In case of pottery the drying time is even longer. A repair can only begin after all pieces are dry. A restoration complete with cleaning, repair, filling, and re-painting will usually take a couple of weeks, at least, often a month or two to complete. What to do after breaking something After breaking any ceramic item the first thing to do is to pick up all broken pieces, even the small ones, and wrap them up. This not only ensures that none are lost, but it also prevents soiling of the breakage surfaces. There are three types of restoration. Of the above three a commercial restoration is the most demanding. The purpose of this is to restore the look of a piece as nearly as possible to its original state. Such a restoration may be hardly or not at all visible. Aesthetic value is the most important. The decoration and glaze will be restored and sometimes a low temperature firing performed. Porcelain restored this way will usually be for sale, or for a private collection. A museum restoration is for the purpose of display. Usually, any mended places remain visible and there is a requirement of reversibility of the restoration. Restorations for research have the least requirements due to their purpose, which is mainly to establish the look, shape or use of an item.